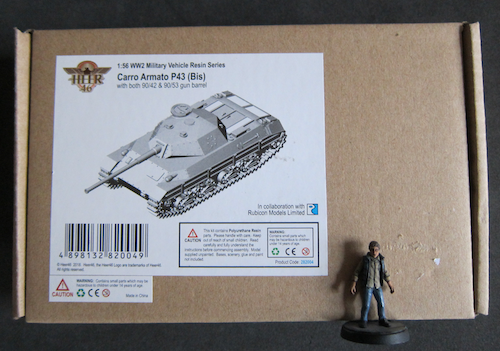 Rubicon/Heer 46 do the Carro Armato P43 bis Italian "carta armatura". What do you think its "Bolt Action" specs would look like? The kit has both a 90/43 and a 90/53 gun. My initial thoughts are Medium Tank, Medium AT gun (/43) with extra HE or heavy AT gun (/53). Armour seems to be in the Panther/ IS-2 range (it had a 100mm front glacis). Gun wise I'd go for a 75mm Kwk 42 L/70 for the 90/43 and a 88 for the 90/53 - at least looking at the comparable guns listed on Wikipedia. So you could just go with a Late War Panther's stats and remove the machine guns. If you give it the larger gun just change that part. Good luck actually finding comparable alt-history tanks for field alongside this. Heer 46' about the only company doing them. There's hardly that many real world Italian vehicles in 1/56th to convert weird stuff from either unfortunately. I don't believe companies like Clockwork Goblin have even produced any Italian specific vehicles - instead just saying they use German or Allied equipment. My plan is to field it (them) as alternative source German tanks rather than operated by Italians (assuming that the factories have survived Allied bombardment and that there are working transport links. The latter being more improbable than the Italians managing to actually build them in quantity). Right, it is sitting in its box awaiting assembly and painting. So, the turret is assembled, but the tracks are just dry assembled. I still have to decide on what to do with the running gear. Camouflage is Humbrol Dark Green and Army Painter Leather Brown over Citadel Zandri Dust.